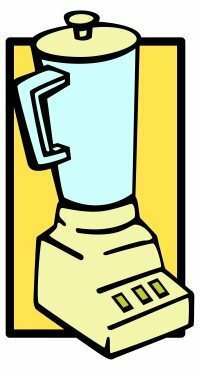 You don’t have to read this entire post to find out what the best blender for making smoothies is. Here’s the answer. The best blender for making smoothies is the one that you’re happy with. It’s that simple. Find a blender that you like and will use on a regular basis. In an earlier post I covered 21 reasons to consume healthy smoothies. It would sadden me to know you that weren’t experiencing all the wonderful benefits of healthy smoothies simply because you can’t find the right blender. Despite what many gurus might say, you don’t need a $400 – $500 blender to make smoothies. Let me repeat that, you don’t need a super expensive blender to make the healthiest smoothies ever! You don’t need a BMW to drive down the road, do you? I’ve been blending away with a $60 Oster Classic Beehive Blender for over 5 years, and I’ve only had one problem. The jar cracked after accidentally being dropped into the sink. Human error, not a fault of the blender. For more information, read my Oster Beehive blender review. To be fair, if you like extremely thick smoothies you may need to add a little more liquid if you’re not using a high powered blender such as a Vitamix or Blendtec. This has yet to be a problem for me. There are many blenders under $100 that will get the job done. You may even be able to find a good one for under $25 at a garage sale or thrift store. It’s a good idea to do some research before purchasing a blender, after all, you want to be happy with your blender and enjoy making smoothies. Here are a few things to consider when blender shopping. Volume or capacity of the blender container. How many servings would you like to make at a time? Smoothie consistency. As I eluded to above, if you like a super thick smoothie consistency, you’ll need to consider buying a fairly powerful blender. Blender speeds. Do you want the option of selecting from multiple blend speeds? If so, will the ability to vary the speeds manually suffice, or do you want the blender to be pre-programmable? Cleanup. Check into how easy it is to clean the blender. Some are easier than others. Noise. Every blender is noisy, but some are really loud. Blender manufacturer. Buying a blender from a reputable company is always a good idea. Additional functions. Some blenders offer much more than smoothie making capabilities. Would you like to make soups, salad dressings, ice cream, etc? When making an important purchase I usually ask friends and family for advice. See what type of blender they have and what they like and dislike about it. Additionally, hop on over to amazon.com and read the reviews for the various blenders they offer. Another option is bullet blenders and hand held or immersion blenders. These are very convenient, easy to use, and cut down on prep and clean up time. At some point I’ll probably shell out the money and upgrade to a Vitamix or Blendtec blender, but for now I’m perfectly content with my Oster. Remember, consuming healthy smoothies on a regular basis is what’s really important, not the blender on your counter top. What kind of blender do you have? What do you like and dislike about it? Update: After much deliberation I purchased a Blendtec Total Blender. To be honest, it’s absolutely awesome! Is a Blendtec Total Blender right for you? Read my Blendtec review and find out. Yep! Great info on blender advice! Not too much to read and right to the point! Thanks for the feedback, Lori. I try to keep things simple and easy to avoid overwhelming people with too much info, which might prevent them from taking action on making healthy smoothies. Stay tuned, a blender review page is in the works. Hi there – just wondering if you’ve taken a look at Omni-Blend blenders? Lots of the same features as the high-priced models like Vitamix and Blendtec, but at a much better price point. I don’t have personal experience with the Omniblend, but have heard good things about it. Do you own one? I’d like to learn more about it because I’ll be upgrading my blender in the not too distant future. This is the blender that I have: http://amzn.to/WoUlPh It’s really nice. I think it’s actually called a “food processor” because it can do way more than just blend. It’s a lot cheaper than the other ones that I’ve seen(some were $100!) and it’s quite durable. Some food processors work just as well as blenders, although they can have trouble with ingredients such as frozen fruit, ice cubes, and fibrous vegetables. The one you shared is affordable for everyone. Thanks for sharing. Nutri-Bullet is awesome for smoothies AND can serve as a mini food processor for many items if desired. The “blender jar” also serves as a glass to drink your smoothie, with attachment screw on tops – one for portability and one for comfort/drinking (so that you are not feeling the screw top while drinking). Cleanup is SO easy – no separate blender jar and glasses to wash. Small/compact unit for space efficiency too. I love mine! That’s a glowing review of the Nutribullet. I’ve been meaning to pick one up for a while now – your endorsement was the final nudge. I just ordered it :) Can’t wait to try it out. Was in need of a travel blender. I have inherited a Healthmaster. Any reviews on this blender yet? The good, the bad and the ugly? It is new so I am considering selling it before I start my new “smoothie” lifestyle. 85 lbs to lose. Will update on my progress. 52 year old male. 5’10” 275 lbs. I’ve not used a Healthmaster before. Looks like a good blender though. Put it to the test before you sell it. Good luck shedding that 85 lbs. My husband got me a Bella brand bullet style blender recently. I love it. It is small, comes with three cups in two sizes with lip guard tops and solid tops. It has two different sets of blades for mixing and grinding. It is not too loud and works perfectly for single serving smoothies since I am the only one at my house drinking them. The price was right too at around $27 from Amazon. Thanks for sharing this information about the Bella brand bullet style blender. Sounds like a steal at $27. I may have to purchase and take for a spin. I just bought a Bella bullet blender today.. glad to see this review! it was 20 bucks at Big Lots. Hello I just bought my 1st blender a hamilton beach ( multi blend blender) I am brand new to making smoothies so hope all goes well. I will be making protein smoothies to replace a meal. Any feedback would be nice. Let me know if you have questions after making a few smoothies. Thanks for sharing your experience with blenders. I still have a soft spot for my old Oster Beehive as well. I have limited experience with the smaller, bullet blenders. Will have to try a few out and post reviews. I’ve got a Vitamix on the way which I’m anxious to try out and see how it fares compared to my Blendtec. Which do you like better since upgrading – Blendtec or Vitamix? Model? I prefer Blendtec, Micheal. Both the total blender classic and designer series. Vitamix is still viable, but it’s Blendtec for me. I just signed you up for my newsletter, Tina. Just confirm and you’ll get my smoothie recipe e-book and recipes sent via email on a regular basis. Please send me recipes of healhty home made recipes. How often do your newsletters come out? I subscribed in early May, but haven’t received any newsletters after the original confirmation email. I also can’t find the smoothie e-book on my computer after signing up for it at that time. I have just been following your website for recipes, which has been awesome! Thank you so much for your delicious recipes on your website, and all the other helpful information. My email newsletters are weekly for the first 10 and then every other week. Perhaps they’re going to your spam folder. Check there first. You can always re-subscribe – although you might have to use a different email address.